On Thanksgiving Day, families across the country will sit down for huge feasts, filling their bellies with turkey, stuffing, mashed potatoes, and lots of gravy. My mouth is watering just writing about it. In many households, it’s tradition for each person at the table to say what they’re thankful for and express their appreciation for the meal in front of them. But when it comes to that delicious meal, we often overlook the workers inside the poultry slaughter facilities and processing plants who do the incredibly labor-intensive and dangerous work required to bring our turkeys from farm to table. This year’s the perfect time to get woke. At this very moment, the U.S. Department of Agriculture (USDA) is considering a petition that would eliminate a standard that sets the maximum speed of poultry plants’ “evisceration lines” – that’s the line of hooks or hangers that carries live birds to be killed, scalded, defeathered, and have their feet and organs removed – at 140 birds per minute (bpm). That’s already 2.33 birds every second. Trying to keep up with that speed, workers throughout the plant commonly suffer musculoskeletal injuries like carpal tunnel and shoulder injuries performing tasks that require forceful and repetitive twisting, cutting, and chopping, often from awkward postures. USDA has previously attempted to speed up poultry processing lines as part of an Obama-era rulemaking to “modernize” the inspection process by removing federal inspectors from the line and having them do more microbial testing. However, after a hard-fought battle by workers’ rights and food safety advocates, which included CPR, the agency ultimately decided not to move ahead in its final rule with the provisions that would have allowed an increased line speed. Fast forward to today and there still aren’t any new studies or evidence to support increasing line speeds through the standard rulemaking process, so the National Chicken Council is searching for a back door around the line speed cap by requesting that USDA grant an industry-wide exemption from the rule. Allowing lines to move even faster would only increase the risk of workplace injuries. Moreover, going about this through the waiver process means advocates, workers, and the public have little opportunity to comment or to ensure the agency gives their comments the meaningful consideration it would be legally mandated to provide if it were following the standard notice-and-comment process. Despite the clear evidence that accelerating line speeds would expose workers to even greater risk of crippling injuries than they already are, USDA is not only considering this industry petition to waive the line speed caps, the agency is working on a new rule that would likely allow line speed increases in pork processing facilities, as well. That’s clearly not an improvement for worker safety or food safety. This Thanksgiving, we should all take a moment to express our gratitude for the workers, across every industry, who make our family festivities possible – from poultry plant workers to the store clerks who have to skip out of dinner early to go to work at midnight in preparation for Black Friday. I’m not talking about merely expressing thanks at the dinner table – that’s the minimum we could do. Begin by acknowledging those workers you encounter. Tip a little more over the holidays. And stand with workers by speaking out against the unfair policies and dangerous working conditions they face day in and day out. Take the first step today to make your voice heard by sharing your thoughts on the line speed proposals with USDA. You can do that here. Katie Tracy, J.D is a workers’ rights policy analyst with the Center for Progressive Reform. On the 23rd you reported the current issue regarding occupational hazards for poultry workers. 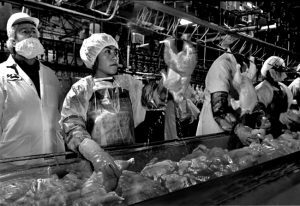 With these poultry plant’s lines already running at 2.33 birds per second and causing workers to suffer injuries and illnesses, eliminating that standard and allowing for the lines to run even faster is preposterous. We need to look at this issue from a multitude of levels to realize how terrible this policy change could be for the health of workers, but also the general public who are consuming this poultry. As a vegetarian and someone who cares about the public’s health, the public and USDA should not give in to the National Chicken Council’s request for an exemption from line speed regulations. This would put even more undue risk for the workers as well as the consumers who cannot be guaranteed that their poultry is safe. The National Chicken Council is pushing to make more money and increase productivity over caring for their workers and the public’s safety. One thing that could really make a difference would be to further research on how to reduce illness and injuries among meat industry workers and then set regulations regarding poultry line speed off of evidence-based research rather than being heavily influenced by unethical decisions based on money by biased sources such as the National Chicken Council. This extends into the other meat industries as well so that overall workers can be protected and consumers can still have their needs met, yet in a safe way.